I ended last night with pain in my left foot and have no idea what it is or where it came from. But it hurts and I pass on training today.Edit: The quality of the writing on this blog will now probably move down a notch or two. 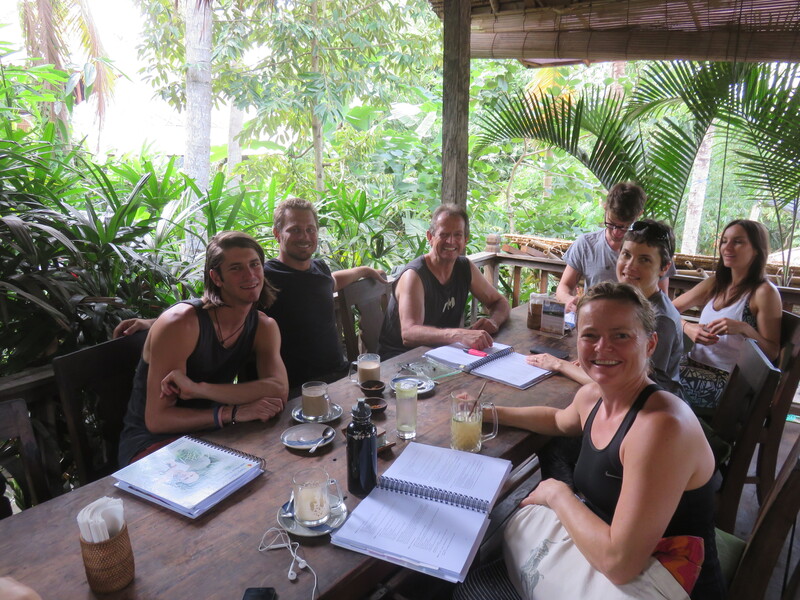 It’s clear to us that Katja’s course take all the time and energy that she can give, and that leaves little time to proofread and publish these posts. Sadly that means I will now be proofreading my own texts, something I dear say will diminish the quality a bit. I’ll do my best, but if you find any error in the writing – you can keep it. I’m that generous. I take a lazy morning with a long breakfast and then tea on the terrace. 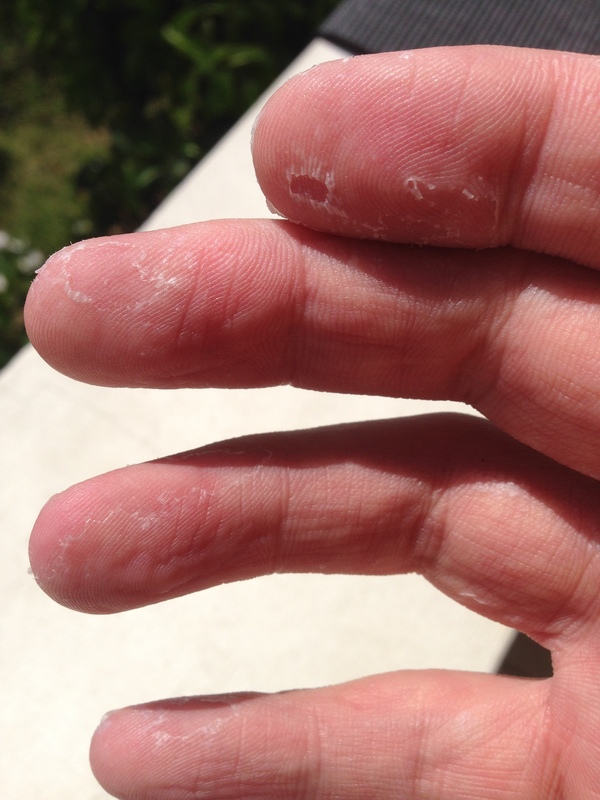 My hands and feet are losing all their skin from training yoga. Never happened before, but I look like a something out of a Merry Shelley book. I peel of skin from the feet and toes and take off as much as I can, and then peel the fingers like bananas. I don’t know if I react to the cleaning products they ask us to use after class to clean the mats. It wasn’t in use when we were here before, so it might be that. As we have our own mats I now bring one to class to see if it helps. I take a walk up the street to see if there’s anything to see regarding the Galungan festival, but the streets are all empty. I walk past a few temples and in some there are people dressed in native costumes praying, but no real celebration. The Balinese believe in ancestral spirits and your own shadow spirit being close by. The festival is one of the biggest they throw when it’s held. It’s run every six months to invite and send back the spirits. I walk around town and ends up at Hubud. 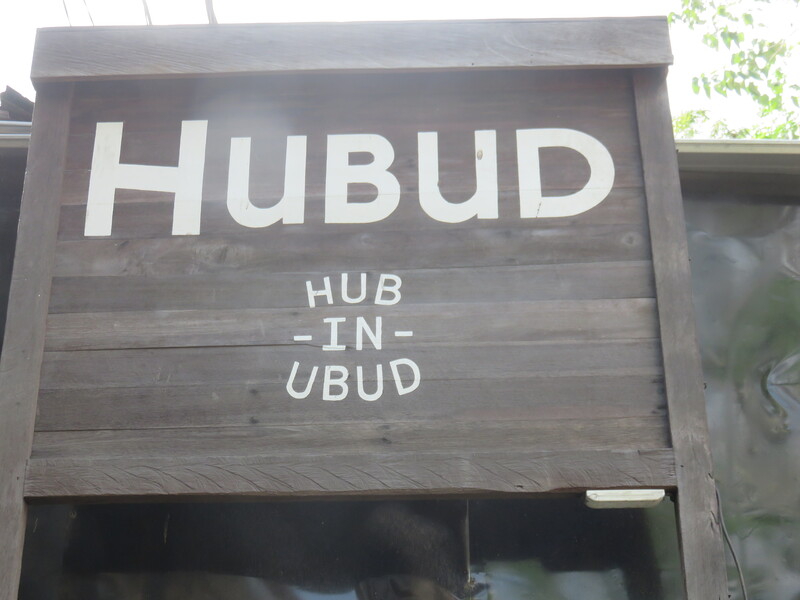 The Hub in Ubud. A place where you can rent a working space. I sign up for a twenty five hours pass and spend an hour there. I go online with my work mail and start the clean up. It’s less junk than expected, but seriously – how do all these junk senders find my e-mail address? I also sign up for a free workshop on Bitcoins. I know of it, but not much about it. There’s a 101, a intro class, at 17:00 and I’ll be back to that one. I grab lunch on the way back home and spend an hour on the pc back home. Every IT guy with any self respect has some form of storage at home. My “server” is hosted by a good friend while I’m traveling. My system disk is running full and I’m panicking while desperately trying to clean up. I visit Katja at the barn and say hello to some of her new classmates. Looks like she got in with a good group. Katja is still at her class when I leave for the Bitcoin seminar. It’s very good indeed. The guy teaching is formerly employed in the internet payment industry. He gives a good story about how money is supposed to work, and how it’s manipulated, before we move into the Bitcoin part. I will not try to explain it, but I’m now the proud owner of about fifteen USD in Bitcoins. There are several institutions on Bali that accept Bitcoin as payment. From restaurants to bicycle rentals. 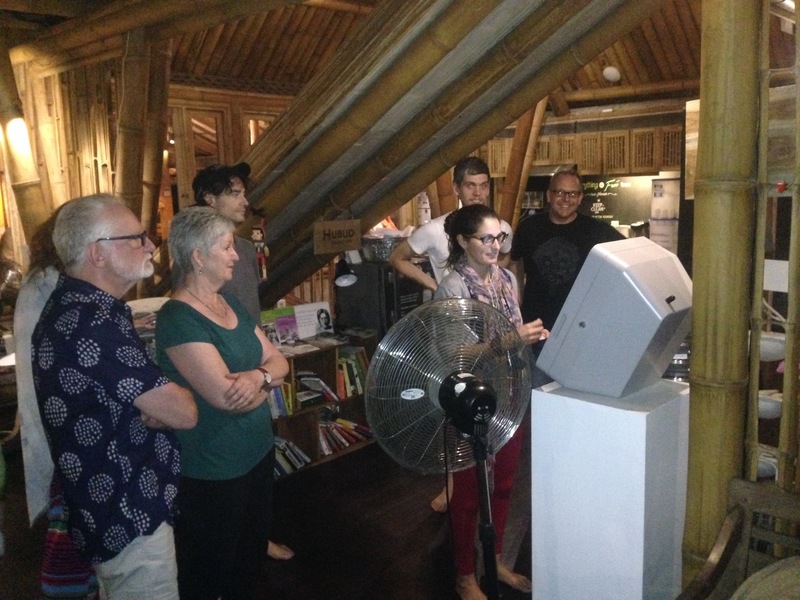 At Hubud they have a machine to convert Indonesian Rupiah to Bitcoin. When I arrived back home Katja was there and has been running around like a chipmunk to try to get a massage. I had not left the room key when I took off and that made for several tours to and from the reception. No massage to be had unfortunately. Most of the restaurants are closed do to Galungan, but the Italian across the street is going strong. I pop in and order take away and go back to the hotel in the meantime. They estimated up to half an hour to get served and it’s just across the street from our hotel. I find Katja in bed with a heap of books and papers as she’s doing homework. As if the ten hours already today wasn’t enough. I go back out and pick up the food and we eat a nice but quick dinner on the room. Katja goes back into her books and I spend my last waking hour between being her guinea pig and reading a little.